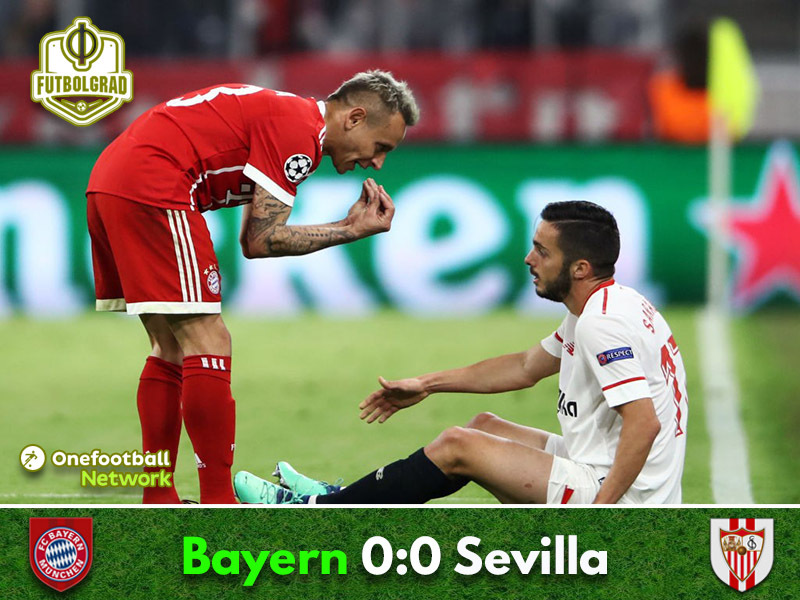 Bayern v Sevilla was a nasty affair and in the end, Bayern München advanced to the semifinals thanks to a bore 0-0 draw at the Allianz Arena. Bayern remain undefeated at home. Müller and Boateng with their 100th game in Europe. Bayern were on the forefoot from the getgo, and Robert Lewandowski was off to the races in the third minute and would have been through and was stopped unfairly by Gabriel Mercado, who looked like he was the last man. But the referee decided to award a yellow card and James then just about curled the ensuing free kick over the crossbar. Bayern kept up the pressure, and in the sixth minute, Lewandowski’s header from eight yards out was tipped over the bar by Sevilla keeper David Soria. Sevilla were lucky to withstand the early onslaught and slowly but surely managed to untangle themselves from Bayern’s stranglehold halfway through the first half. Bayern, in the meantime, were sitting deep trying to find an opening to hit the Spaniards on the counter-attack. In the 33rd minute, Mats Hummels almost gave Bayern the lead – receiving the ball at the far edge of the penalty box Hummels made a surprising Robbenesque move to the centre and then curled a shot on goal that missed the goal by just a fraction. Bayern increased their pressure and in the 37th Frank Ribéry had a close-range effort turned aside by Soria. Bayern kept coming in the 40th Jesus Navas just about denied Ribéry a tap-in chance after a low Thomas Müller cross. Just before halftime Javi Martínez almost gave away the opener playing back a terrible back pass that sent Franco Vazquez off to the races and only a last-minute diving tackle by Rafinha prevented the lead in the 45th minute. Bayern pressed right from the get-go after coming out of the dressing rooms and in the 49th minute Lewandowski almost scored after receiving a high lopped cross from Rafinha inside the six-yard box, but the ball hit the outside netting. Bayern were now more adventurous, perhaps needlessly so as it allowed Sevilla more room to go on the counter-attack. Bayern were dominant, but Sevilla’s Joaquin Correa had the biggest chance in the first 15 minutes of the second interval after his header following the crossbar hit the crossbar. Bayern, in the meantime, were dominant but seemed almost to lack the determination to deliver the final blow to the Spaniards. Instead, Bayern seemed determined to see this game out simply. Dominant in midfield and able to break forward the German champion got into Sevilla’s box on several occasions without pulling the trigger to score the game-winning goal. Instead, the game ended with a bore 0-0 draw with the only highlight coming at the end of the match with Correa being sent off with a red card after a brutal challenge against Javi Martínez. In a match that produced very few highlights, Javi Martínez earned the player of the match performance. In a match that was dominated by physical play Martínez was the rock in Bayern’s midfield ensuring that Sevilla never had a chance getting back into this match. It may not have been pretty, but in the end, Bayern got the job done against a Sevilla side that were extremely physical. Bayern had 18 to 10 shots on net and Sevilla were able to keep the match even. Bayern, however, won 57% of their one-on-one situations, which in a game that was nasty at times was key to win the game. Bayern have kept their 100th clean sheet at home in European competitions. Thomas Müller and Jérôme Boateng both played their 100th game in Europe. Bayern are now undefeated at home for 20 games in a row.